* Destroy gaudy baubles and silly ornamentation! 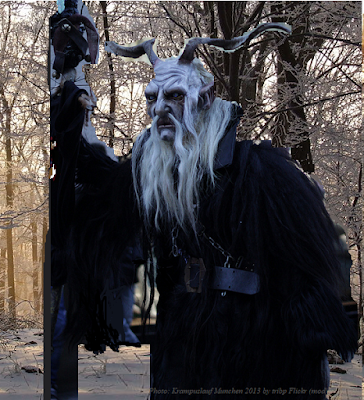 Special: Krampus bans clerics from his service for being too prone to merriment, allowing only sorcerers and some shamans to follow him. Krampus Sorcery: Being a true spirit rather than a divinity, his followers practice sorcery which can be quite unpredictable. Krampus sorcerers must achieve one higher level to cast spells than clerics of other gods do (for 2nd level spells and above). For example, if using Labyrinth Lord rules, they need to be 4th level in order to cast 2nd level spells (rather than 3rd), 6th level to cast 3rd level spells (rather than 5th), etc. In return, they have a 50% chance of being able to cast each of their spells an extra time each day (roll after a spell is cast to see). What is more, a Krampus sorcerer’s spells might even go off when he doesn’t wish them to! Whenever under stress- whenever he sees something overly merry, garish, or the naughty not getting their just desserts- there is a base 5% chance of one of his spells being cast on a random target in range. If this occurs, treat it as if the sorcerer cast it himself. Krampus shamans will experience the same, though they have different spell selections, even requiring communion with the land to access specific terrain spells (if using Ukko’s rules). 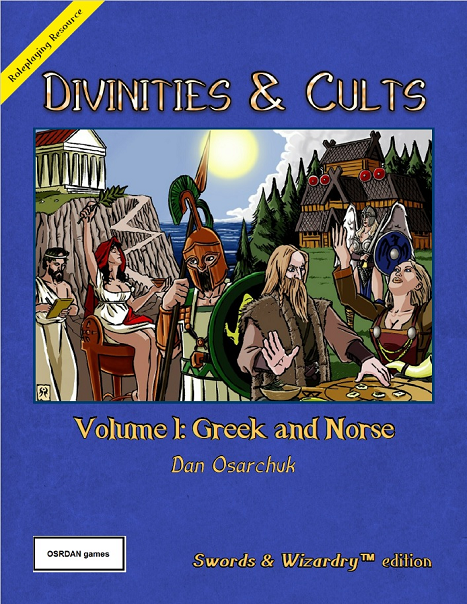 Otherwise, see Divinities and Cults: Volume II for other guidelines for that class. The magic of Krampus is grim and not at all jolly. Roll 1d12 to see what might happen whenever a Krampus sorcerer casts a spell. 1. Walking in a Krampus Wonderland... Chill winds blow and trampling, phantom reindeer abound, causing all non-followers of Krampus within 30’ of the spell’s casting 1d4 damage, double if they are particularly merry or are drunken grandmothers. 2. Merry is Very, Very... Wrong! Krampus requires immediate placation. 1d4 presents must be taken away from those who have been naughty or who otherwise peddle nonsensical Yule baubles and ridiculously priced greeting cards and be burned in sacrifice, either before the spell is cast or soon after! Those being so punished likely won’t appreciate it (a base 85% chance). If no such presents are available, then the sorcerer will simply whip the next person he sees for 1d3 damage instead. 3. Wreck Your Halls: The magic will work, but only if it is used to punish the naughty, destroy ornamentation, or silence irritating mirth. 4. It’s the Most Grimmest Time of the Year! Where people got the idea to be jolly in the dead of winter and make nonsensical purchases all for the benefit of tinsel obsessed and crooked merchants is beyond Krampus. In any case, the spell needs to be cast when it’s cold, dark, and/or generally grim. Otherwise, it only has 50% of its normal potency. 5-9. No Side-Effect: The spell works normally. 10. Sinister Bells: You better watch out! Krampus’s disturbing chains jangle, causing all within 60’ to save vs. spell or flee in righteous Yuletide fear. If the spell’s target then remains, he or she experiences 50% extra effect from it. 11-12. Krampus Cheer: The target experiences the spell’s full effects (a save can still apply though). In addition, if it would be used to punish those who have been naughty or who are being ‘merry’, then the spell has twice the effect! This is a special Yuletide double posting. Next week: Sorcerers of Krampus, Part III! What spell shall we cast next, dear? Oh, those men love to watch! 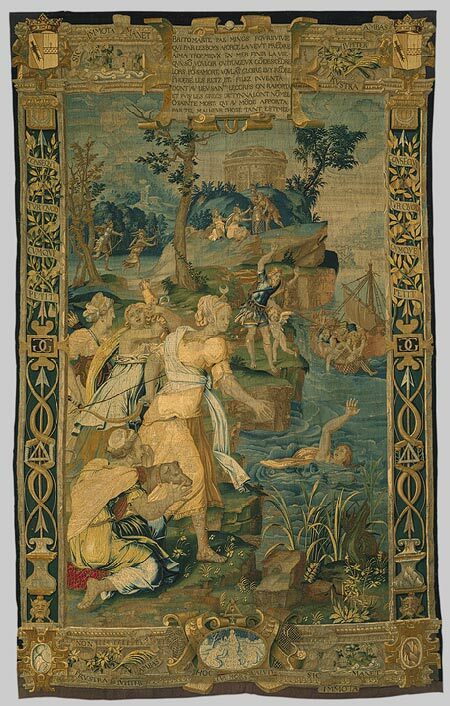 Enjoying her nets and mountains, an Avatar of Britomartis appears as a beautiful and free-spirited woman. She's thrilled to meet fishers, trappers, and others who make their living from the mountains or sea and especially favors females. In fact, any she meets will be granted a +1 to all rolls for the next 1d12 hours, thanks to her Good Maidenly love. Those who would harm women though, such as Minoan kings chasing them into the sea, will instead receive a curse. 1. The party arrives at an isolated enclave consisting solely of Britomartis worshippers. These women need some help with fixing various things... and with breeding. 2. 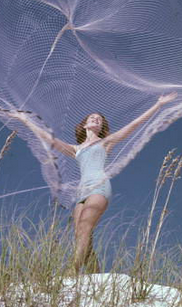 A Britomartis priestess casts her net on the party, trapping all those who fail to avoid it. 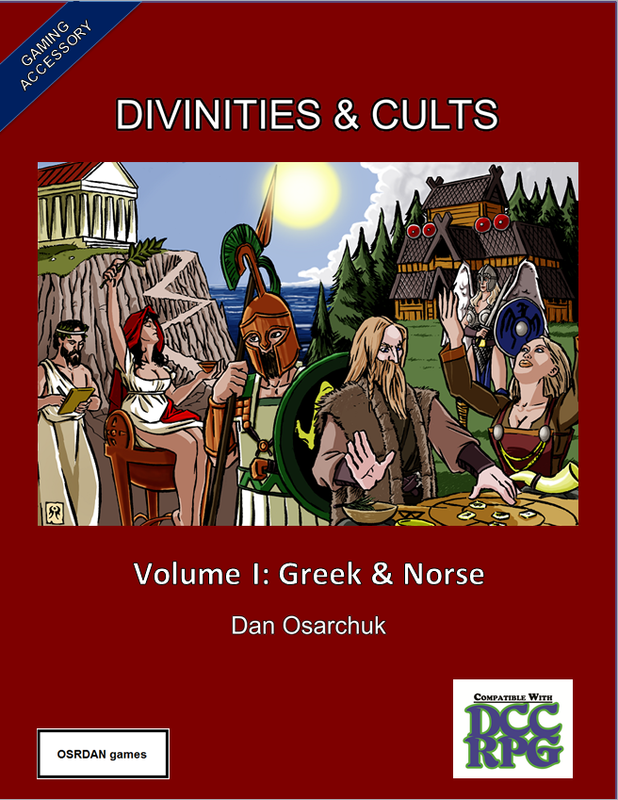 She is accompanied by 1d4 amazon warriors (see Divinities and Cults: Volume I) and will kidnap any women in the group for their secret rituals, leaving the men behind. 3. A false cult claiming to follow Britomartis wishes to force her ways upon an entire land. The party might need help from real followers of Britomartis to stop it and restore traditional ways again. 4. An attractive woman is spotted up ahead. She either follows the Path of Britomart, Diktynna, or Aegina-Aphaia. She also has a 10% chance of actually being an Avatar of Britomartis! Next week: we spread some Yuletide cheer with a sinister being! The Good Maiden loves her faithful, though even they can get caught in her nets from time to time. 1-4. Struggling in the waters, pursued by Minos (whether metaphorically or not), the priestess takes a penalty to all her rolls equal to her divine test result (-1 to -4), double (-2 to -8) if she is actually trapped or being pursued by a man. In any case, the penalties last for 2d3 hours. Spend at least 1d3 hours in an area where there are only women (preferably on an island). 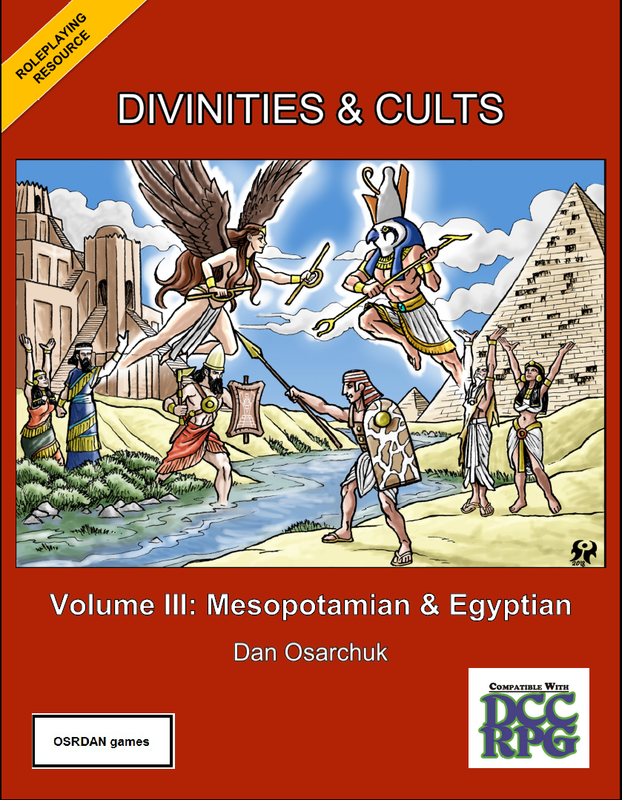 Worship at a temple of Artemis or similar goddess for at least 1d3 hours, or even before a priestess of one. Engage in commerce (i.e. shopping)! 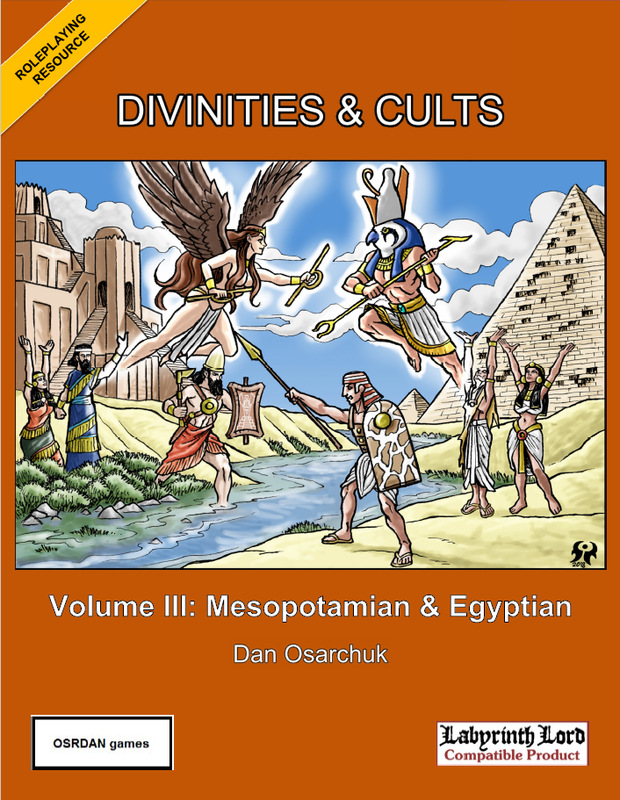 Acquire a new piece of worked stone or wood for ritual purposes. Assist fishers, sailors, or even others who make their living from the mountains. Be followed around for 1d3 hours by 1d3 huge, vicious sacred dogs. They won’t harm the priestess and are actually overly protective, attacking any adult males that come within 30’ of her. Treat them as black bears. 10-14. For better or for worse, the priestess merges with Britomartis, becoming more like her goddess from now on. Roll 1d3. Like mountains rising above the sea, so too does her bosom expand. The priestess gains +2 Charisma, but also -5’ speed due to its new bearing and weight. The sea nets of Britomartis can be ensnaring. From now on, any who stand next to the priestess and is romantically compatible must save vs. spell or become charmed by her scent, also suffering a -1 penalty to all rolls for the next 1d6 turns. Some take Britomartis to be a nymph and so too now do they take the priestess. She becomes immune to any ill effects of climate (often barely clad to emphasize that fact) and gains a further +2 Charisma bonus with regards to attractiveness. Still, she now also suffers a -1 to all rolls unless she spends at least 1d6 turns each day in a watery or mountainous environment. 15-17. The priestess experiences one of the three paths of Britomartis. Roll 1d3. 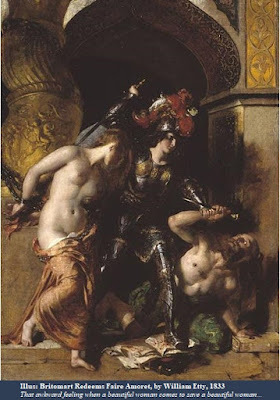 Way of Britomart: A true virgin warrior maiden, she can now wear any type of armor but will suffer a divine test if she ever violates her chastity and takes a -1 to all rolls for the next 1d6 turns if she even considers doing so. Way of Diktynna: A queenly Minoan bull priestess, she can now wield two Labryses or other types of axes at a time and gains a +2 bonus to all rolls related to women. On the other hand, she must always bear her breasts bare, suffering an AC penalty of 2 and stares from those unfamiliar with Minoan ways, as well as a -10 penalty to resist or escape nets of any type. 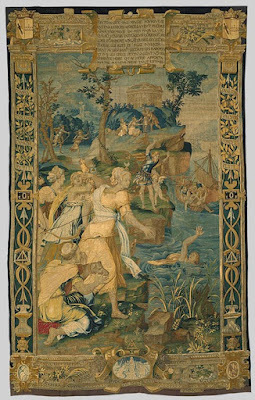 Way of Aegina-Aphaia: A mysterious river nymph, she can now breathe water at will, swim at double speed, and detect treasure within 60’, though a person may become jealous of her wealth or she might be carried off by Zeus to a random island to bear his child (a base chance each day of 20% with the former; 3% with the latter). 18+ Her nets draw her down, her mountains rise as she struggles to be free. The priestess remains confined to the nearest body of water for 1 day per divine test total over 17, unable to escape during that time. She can then only be moved by fishermen or similar types until the test’s duration is over. Next week: Priestesses of Britomartis concludes with Part IV! Britomartis favors women of course (who doesn’t?) but is not especially harsh towards men. Roll 1d12. 1. Sacrifice: What have you gathered in your nets and upon your mighty rises? 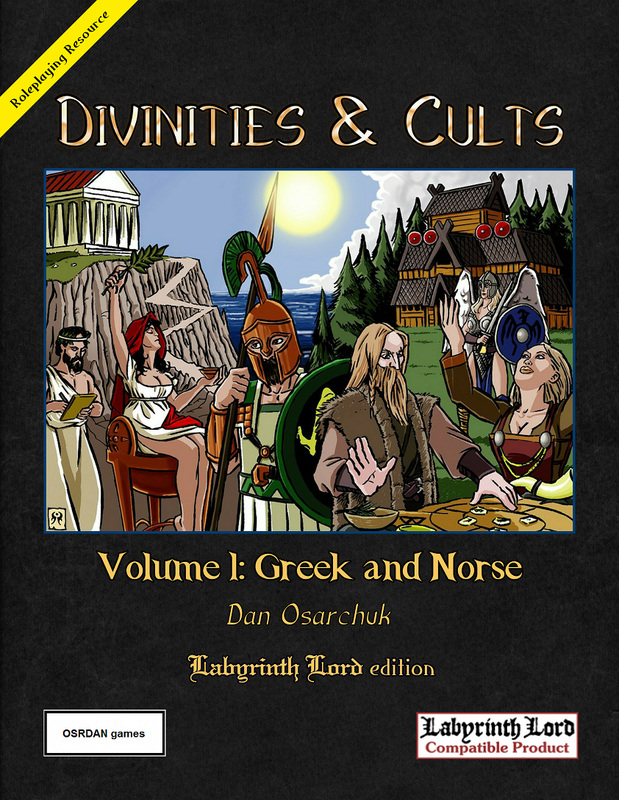 A 1d3 round ritual and offering worth 1d6 gold pieces per spell level are required. But if it is bounty from the sea or mountains, then no ritual is needed and any offering is fine. 2. Sisterhood: If helpful, then the spell will only work on females. If harmful, it will only work on males, as well as those of unknown gender. 3. Devotion: Like a good maiden, the priestess of Britomartis must kneel and offer praise to her goddess for the next 2d6 rounds... and if the spell is beneficial, then the recipient must do so too! In any case, including lyric poetry (requiring a CHA check or the player quickly making up an original one) will grant the spell +50% effect. 4-9. Standard Casting: The magic occurs without side-effect. 10. Diktynna Way: The spell works normally. If the priestess would also like it to have a 50% bonus, she can either become a wooden cult statue (unable to move or speak, but cannot be easily harmed), stuck in nets (unable to move and can be harmed, but can speak), or become ‘mannish’ (able to move and speak, but unable to use her magic). Whatever form she chooses, it lasts for the next 1d6 turns or even provides double the benefit if she chooses for it to last for 2d3 hours instead. 11-12. Love of Britomartis: The spell works automatically and for full effect (though a save still applies). What is more, if the priestess has remained untouched by men for the last 24 hours, then the spell has a 50% bonus. 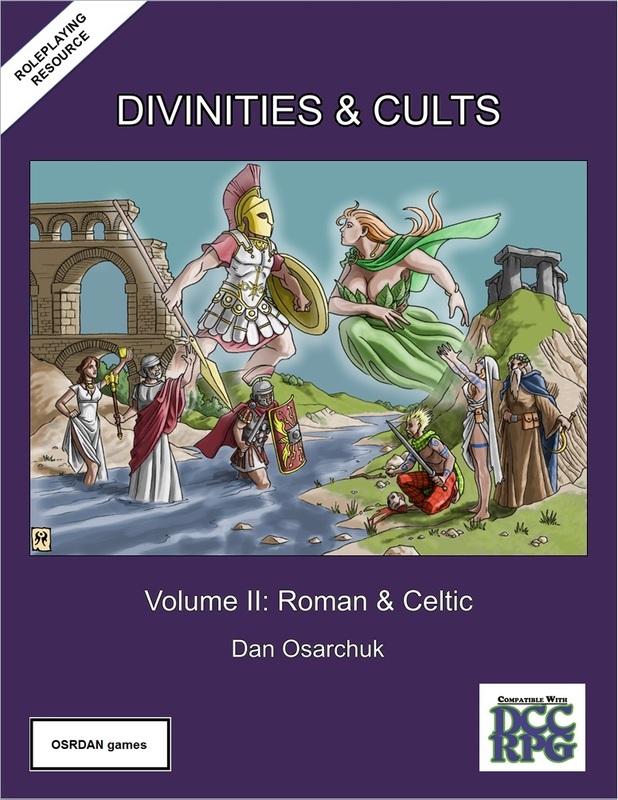 Next week: Priestesses of Britomartis, Part III! Special: Britomartis is served exclusively by women (for obvious reasons), most of whom are priestesses. In Minoan areas, she is known as Diktynna. Mysteries of Britomartis: Up to once per day per level, a priestess of Britomartis can gain a +2 to one of her casting rolls when located near a net or mountain, as well as anything resembling them. 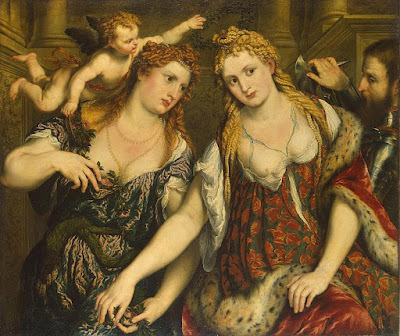 Next week: Priestesses of Britomartis, Part II! Though his commissars would never admit it, Propaganda can be quite magical indeed. Hulking but squat, these embodiments of the Equalitarian Tyrant himself are red in color and made of hell-forged steel. Unless keeping an individual alive would serve his greater interests, the avatar will quickly redistribute his victim’s blood and bones all over the area via mighty slams and crushes. Archenemy of Uncle Steel Dwarf, the Amaranthine Wizard stands in diametric opposition to him and Equalitarianism. Rather than espousing equality, he espouses hierarchy. Rather than attacking capitalists and eliminating private property, he attacks inhumans and seeks to forge pure human nation-empires. Still, his clergy, the Amaranthineschaft, can be as ruthless as Uncle Steel Dwarf’s commissars. As a result, one can use their rules in a modified way until he can be dealt with in a separate article. 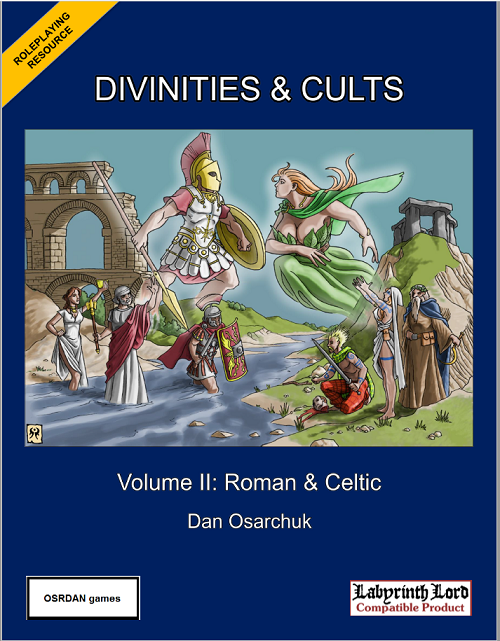 Next week: Priestesses of Diktynna / Britomartis! 1-4. Investigate. Who is Collaborating with Capitalists and Imperialists? The commissar better hope it’s not him! To make sure, he will look into others’ behavior, taking a -1 penalty per Counter-Revolutionary Behavior result (-1 to -4), double if he actually sympathizes (-2 to -8) for the next 1d6 hours. Get at least 2d4 HD of Proletarians (laborers or peasants) to rise up against their masters, unless of course if those masters are Equalitarian. In this latter case, they have a 66% chance of actually needing to be imprisoned instead or even shot if they are deemed Kulaks- ‘affluent’ laborers or peasants. Compel two individuals of different races or even species to interbreed. Willingness of the participants and success of the coupling are Irrelevant- that they are working to make everyone Equal is all that matters! In any case, resulting offspring will be given to serve the State. Confiscate all the possessions from the next person you see in the Name of Uncle Steel Dwarf! If the person is Equalitarian, then he or she is of course given a pass; just confiscate all possessions from the next person you see. Insult an Opiate of the Masses (a cleric) or violate a temple of another divinity. Fear not any reprisals: how many armies do they have? Disrupt a Capitalist Enclave (place of business). Feel free to beat them with anything that they would sell you. 10-14. Liquidate. Death solves all Problems and the commissar has a new Problem to solve. With the power of his Equalitarian Firearm he must execute one individual and cannot use his propaganda for any other task until it is done. Who that should be officially depends on their type of Counter-Revolutionary Behavior, but commissars are good at finding fault with nearly anyone. Roll 1d6. Purge the entire family of one of the above. Reroll 1d5: in the case of another result of 5, expand to include the individual’s local community, then region, country, etc. Books, scrolls, or an object that is deemed Counter-Revolutionary. 15-16. Order 227. Trust no one, not even yourself, Comrade! Now it is an Equalitarian or servant of one who has been found Guilty of Counter-Revolutionary Behavior. Any the commissar knows (or very much suspects!) who has ever surrendered, fled, or even fell back in battle from non-Equalitarians must be shot, including himself. This is why, when it comes to the servants of Uncle Steel Dwarf, it takes more courage to retreat than to advance. 17+ Non-person. 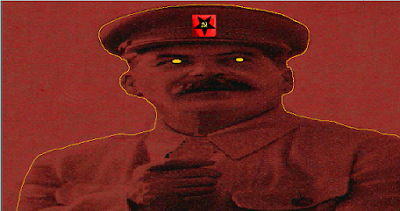 Unless he can find another to Officially Condemn and take his place within the next 1d6 rounds (requiring someone else present, a compelling argument, and a Charisma check that is increased by 3 for every Counter-Revolutionary Behavior Result over 17), the commissar is himself shot, becoming just another statistic. What is more, his entire existence is also erased, all record and memory. It would appear that the commissar’s evil has caught up with him, though the many that he had harmed and slain unfortunately continue to remain so. Next week: Commissars of Uncle Steel Dwarf, Part IV! The magic of Uncle Steel Dwarf, known as Propaganda, is ruthless and harsh- what better way to force everyone to become Equal, comrade? Roll 1d12 every time a commissar does so. But remember: failure to follow the orders of any resulting side-effects will make the commissar suspect of Counter-Revolutionary Behavior (see Part III)! 1. Liquidation: Someone has obviously been Counter-Revolutionary and must be shot for the propaganda to work. An intelligent being must be executed, carried out by the commissar with his Equalitarian Firearm, either at the time of casting or by the next sunset... or else. 2. Redistribution: Uncle Steel Dwarf sees fit to Reallocate the funds of the wealthiest person within 60’ of the commissar at the time of the propaganda’s casting. Since this means that all of their wealth is then given to the State (effectively gone- save vs. death negates), most commissars generally make sure that they have at least slightly less wealth than any of those around them. 3. Reeducation: Some don’t appear to be as devoted to Equalitarianism as they should be! If the propaganda is helpful, then the recipient must receive (re-)indoctrination into the Correct Way of Thinking, requiring 2d6 turns of listening to speeches and forced applauding, completed before the next sunset. If the propaganda is harmful, then the target is considered Sufficiently Reeducated for now. 4. Proletarian Glory: A hammer, sickle, and/or inverted star symbol must be present for the propaganda to work, and there must be at least some red in it! 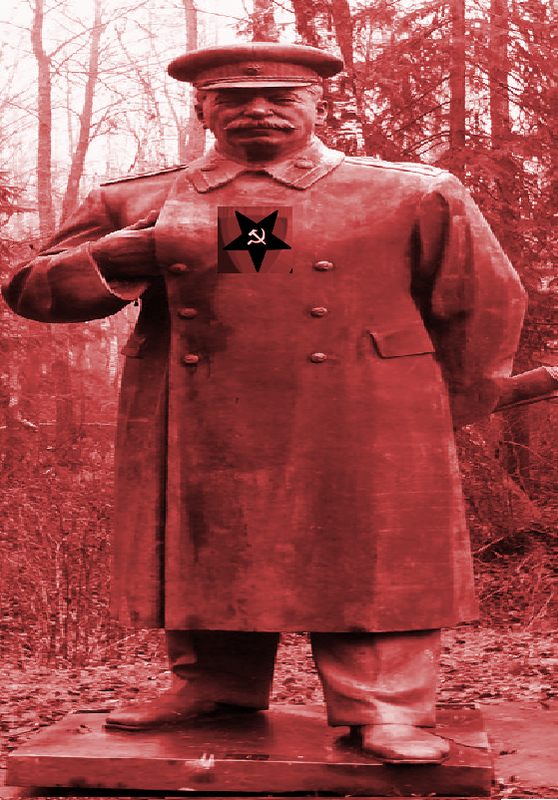 If a portrait or statue of Uncle Steel Dwarf is also available (the only dwarf permitted to have a mustache), then the propaganda has +50% effect. 5-9. Standard Casting: The propaganda works without side-effect this time, comrade, though remember: Uncle Steel Dwarf is always watching you! 10. Workers’ Paradise: Proletarian hands forge the best! The propaganda works normally. In addition, if the commissar would also like it to have a 50% bonus, then he can have at least 1d3 workers, peasants, or similar types do work nearby to expedite it for 2d3 rounds. Still, they will likely end up also performing slave labor afterwards for the next 2d30 years (a base 66% chance), but such is the price of Equalitarianism. 11-12. 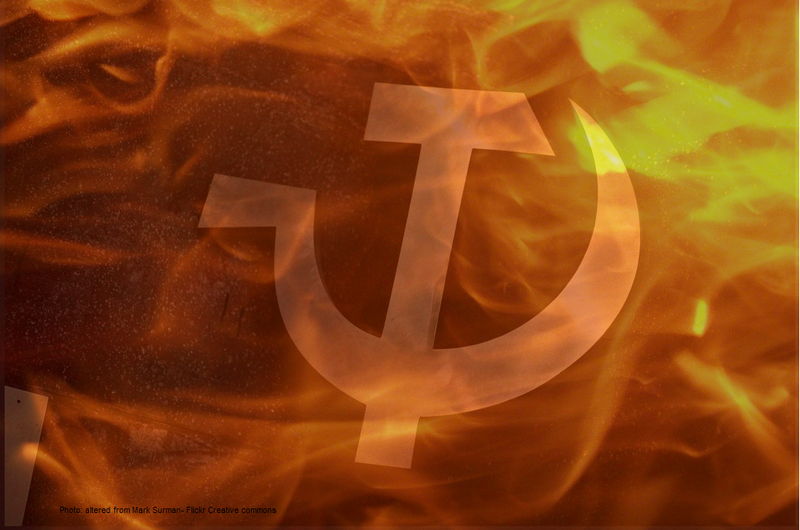 Red Terror: The sounds of patriotic, left-wing music rise and the propaganda works automatically for the full effect (though a save still applies, if applicable). In addition, if the propaganda would harm any Bourgeoisie or other Enemy of the People (property owners, business folk, free-thinkers.- if not known, then there is a base 50% chance) then the propaganda also has a 50% bonus! 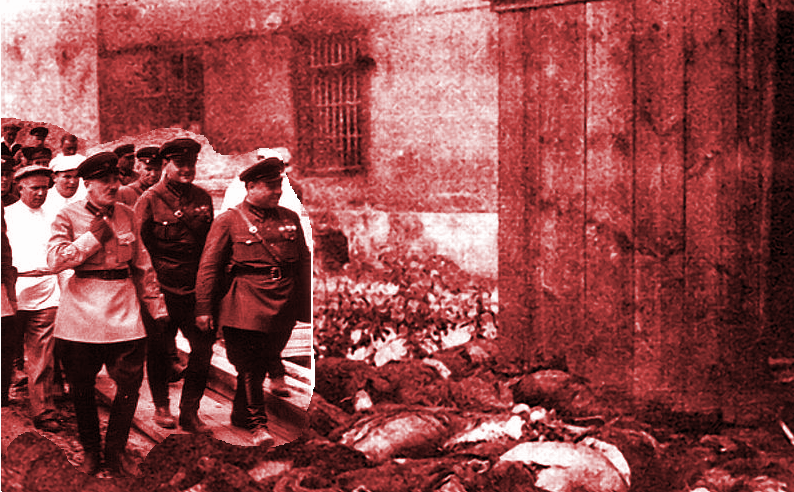 Next week: Commissars of Uncle Steel Dwarf, Part III! * Everyone must become Equal, or else! * All possession and distinction must become Merged! * All who are Counter-Revolutionary must be Purged! Special: Uncle Steel Dwarf is not served by clerics (since they espouse ‘Opiates of the Masses’), but rather by commissars. Most are red dwarves (see Part IV), but there are also a fair number of humans and members of other races in their ranks. Equalitarian Firearm: Up to thrice per day per level, a commissar of Uncle Steel Dwarf can emit a blast of fire and steel from his firearm at a target up to 60’ away, causing 2d6 damage if it hits. In addition, it does double damage to any allies that are retreating or trying to surrender. Next week: Commissars of Uncle Steel Dwarf, Part II! Finnish Shamans have access to the following spells. 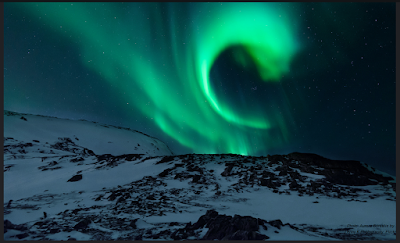 Finnish shamans can also access additional spells depending on where they commune each day. As described in Part I, the process takes 1d6 turns, allowing the shaman to gain a special ability. It also grants him access to up to 1d3 bonus spells of levels he can cast that day, determined at random. Note that a shaman can thereby gain a different selection of spells from two different forests, different fields, different mountains, etc., reflecting the great variation in the animistic world of gods and spirits in which they live. Consequently, mountains grant the highest level spells since it is the dwelling place of Ukko, chief of the pantheon, where he reigns at a point so high in reality that those who visit there must kneel. Communion can be redone during the same day if the shaman spends 1d6 turns making offerings, chanting, drumming, and/or achieving trance states at a different place, but no matter what, he still can only cast the same number of spells each day as a cleric of the same level. 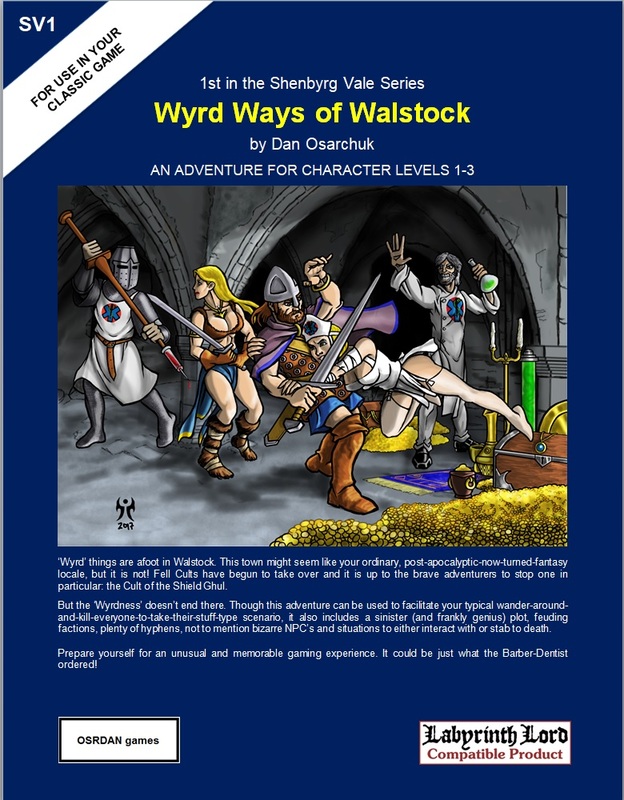 - Wield any weapon, have a fighter’s hit die, and may don chainmail armor and shields or lighter. - May commune, but only at one type of place (field, graveyard, forest, mountain, sauna, or water - determined at character creation) and can only cast 1 spell per day per level. - Can otherwise cast spells and save like Finnish shamans do and can even benefit from communing at their type of place each day (se Finnish Shamanism in Part I). 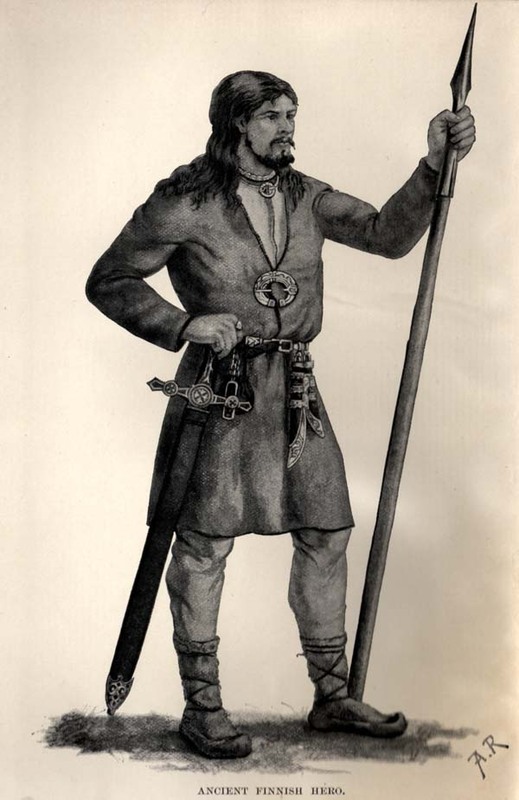 For example, a Finnish Sauna warrior can commune at a sauna or similar place each day to gain either a +6 Charisma bonus when dealing with Finns (and similar types) or ignore temperature extremes for 2d6 turns. He also only works with Sauna spirits when it comes to healing, divine tests, and gaining extra spells. Next week: We find out about a tyrannical demon lord: Uncle Steel Dwarf! 1-4. The shaman takes a -1 penalty per Divine Test result to all his rolls (-1 to -4). It lasts until he spends at least 1d6 turns communing with the spirits and/or gods in a particular type of place. Roll 1d6 to see where he needs to go. Commune at a type of place for 4d6 turns. Leave fitting offerings for the spirits there (per Referee). Drum and dance at a type of place for 1d6 turns. Also have a 50% chance of hallucinating (as per the Confusion spell) for 3d6 turns afterwards. Travel in astral form to the spirit world version of that place, which takes 1d6 turns but also causes 1d3 damage to one of the shaman's ability scores (determined at random). Battle a being or endure a peril in the area for 2d6 rounds, taking 2d6 damage. 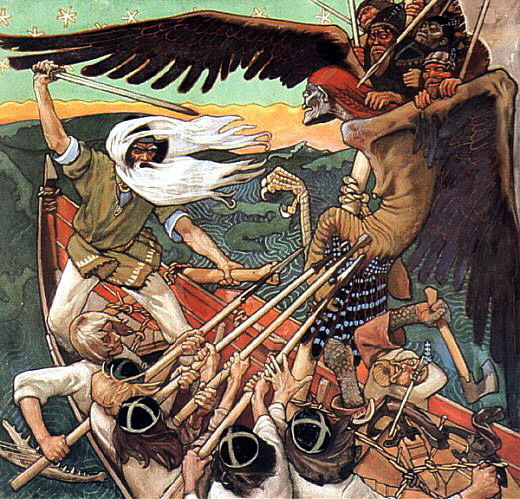 It is actually a Finnish god or goddess who must be placated. Roll 1d6 again twice to see what else has to be done to regain the spell. Additional results of ‘6’ should then be rolled thrice, etc. 12-16. A spirit possesses the shaman or a nearby person, animal, or object. Though the one possessed will now benefit from special bonuses, the shaman must also save vs. spell to resist acting in a way that the spirit would promote- whether from direct influence of the spirit or by whomever or whatever it is possessing. What is more, the one possessed also experiences any of the restrictions the spirit might have (see Volume II). First, roll 1d6 to see who or what is possessed. Note that even if the shaman is not himself possessed, the affected individual or object will stay with the shaman for the duration, attempting to affect his actions. This arrangement lasts for 1d6 rounds the first time this test occurs, 1d6 minutes the second, 1d6 turns the third, 1d6 hours the fourth, etc. Note that Fair Maidens usually don’t possess people or objects that aren’t already hot women. 17+ The shaman slips into the spirit world to undergo a journey and even seek out the Sampo. He is gone for one day per Divine Test result over 16. Those with the ability to travel to Otherworlds may attempt to find him before then (a base 10% chance of success per caster level). Otherwise, he takes 2d12 hit points of damage and gains 1% bonus experience for each day he’s gone; that is, if he survives! Next week: we’re not quite ‘Finnished’- check out Shamans of Ukko, Part IV!